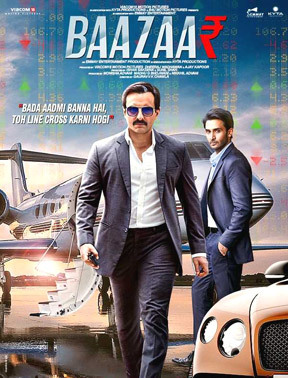 Presenting a fresh premise of stock market and its sudden ups and down, BAAZAAR comes up as a more than decent film that is not any adaptation proving the speculations wrong, but surely finds its conceptual inspirations from films like THE WOLF OF WALL STREET from the west, our own GAFLA (2006), SHIKHAR (2005) and more. At the same time it’s also isn’t any well prepared film on the subject, yet again using the same old Hindi film clichés post a great start. It begins focusing on Rohan Mehra - a small town stock broker, who wishes to reach the sky through the stock exchange and also talks to the viewers (breaking the fourth wall) reminding you of Kevin Spacey of American TV Series HOUSE OF CARDS. The film starts impressing as soon as he reaches the town meeting Radhika Apte and then brings in some clap-worthy sequences with the introduction of Saif Ali Khan as the controversial king of the trade. This particular part of the film is actually a winner having some exciting sequences, electrifying performances and well-written dialogues making a fine use of Gujarati (though the accent might have got some issues). The story progression keeps you engaged providing the entertainment factor and one feels eager to see the expected explosive clash between Saif and Rohan coming next in its concluding hour. Unfortunately the pace drops post the intermission, the excitement calms down with a few occasional peaks and the film narrates a completely bizarre and unconvincing conclusion ruining the big favourable impact made by the first half. In fact the climax takes you back to the story-telling of the 80s, strangely mismatching with the film's otherwise new-age theme and novel treatment. Equipped with a fine cinematography, production design, costumes, and background score, BAAZAAR yet again delivers nothing in its music department, also including a Punjabi based song when none of its key characters is connected with the language or region. No doubt it was just blindly added following the present trend to woo the domestic and foreign market and nothing else. Besides, where the first half is edited superbly the second half lacks the quality may be due to the faulty writing. Ironically Rohan talking to the viewers also suddenly gets forgotten post interval pointing towards the huge difference between the film’s two halves. Coming to its key merit, BAAZAAR thankfully scores the maximum in its performance department. Good to see Saif Ali Khan back in form, in complete control of his act playing the evil businessmen. Perhaps he is the only actor of Hindi cinema with such contrasting performances in his various films pointing towards his extreme mood swings and uncaring nature when it comes to his own career in films. This certainly has one of his best acts till date that might be surprising for many. Rohan Mehra (son of actor Vinod Mehra) is confident as a debutant but makes a much better impact in the first half in comparison to the second. Radhika Apte as usual is charming and impressive in her important act and so is Chitrangda Singh in her few scenes. However I do feel, somehow Chitrangda looked more beautiful and sensual in her first few films. On the other hand, the supporting cast brilliantly plays the given roles as required including Manish Chaudhari, Denzil Smith, Sonia Balani and more. In all BAAZAAR, competently directed by the debutant Gauravv K Chawla, has a very fine first half, an average second and an outdated climax, resulting in a fairly watchable above average urban venture lacking the mass appeal.